For a modern addition to your wardrobe, India's Alok Jain presents this ring. Full of might, the ring is crafted of high-polish sterling silver that circles the finger, crowned with a square stone of earth-tone tiger's eye. 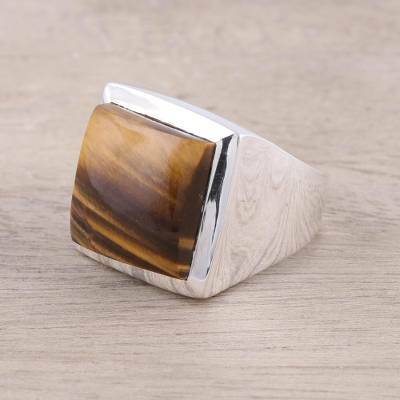 You can find tiger's eye ring 'Might' by Alok Jain in jewelry categories such as Modern Rings, Gemstone Rings, Tigers Eye Rings, Silver Rings, Sterling Silver Rings, Cocktail Rings and Single Stone Rings. Enjoy exploring these sections for other Novica treasures.